Can the music inspired by a Firle landmark be rediscovered? If twenty-nine year old composer George Butterworth had not answered his country’s call to arms in 1914, English classical music rooted in the beautiful melodies of folk-song might be even broader and brighter with treasures. By the start of World War I, Butterworth had discovered his true vocation as a composer of lush orchestral textures and poignant songs. He travelled England, especially Sussex, recording on primitive machines or writing down in inns and markets the traditional songs of this land. But, like millions of others, he was lost to the First World War at the age of 31. Not even his body could be retrieved after he fell. To this day, many critics regard him as the most promising composer of his generation. His tiny catalogue of just fifteen works, more than half of them songs or song cycles, is still popular around the world today, wherever evocations of English rural idylls or the lost beauties of the countryside are sought. And one of those idylls takes us up to the majesty of Firle Beacon. After Butterworth’s time reading Greats at Oxford, where he excelled in music to the detriment of his other studies, he taught and composed a little: but the modest library of pieces he left are some of the finest examples of the English renaissance in national music, celebrating the folk music tunes and styles of this country. In 1907, at the age of 22, he journeyed widely in England, especially here in Sussex, collecting over 450 folk songs from this area. As he paid his respects to our local heritage of song, perhaps it was around this time that he became acquainted with Firle? 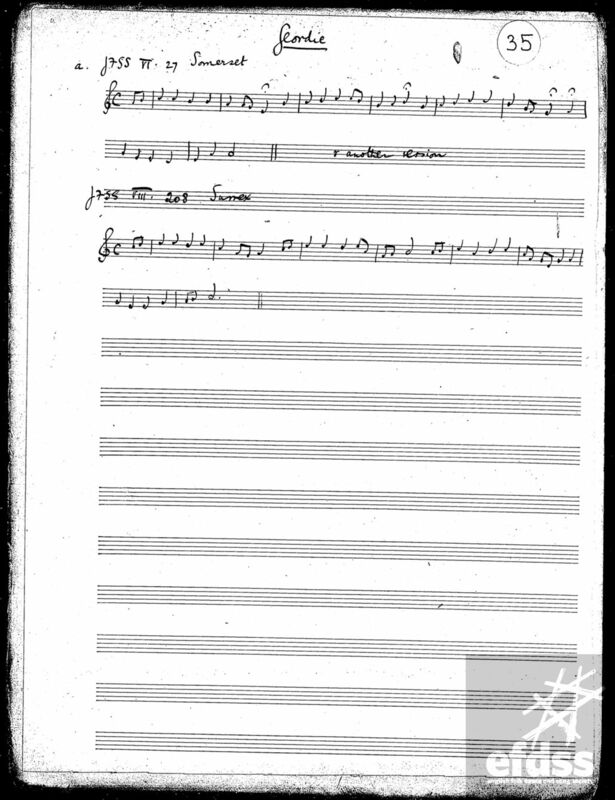 His own manuscripts, with the musical notation jotted down in a neat but sharp hand, tell us for certain that he heard songs at least as close as Rodmell, Lewes and East Chiltington (images here are from the Vaughan Williams Memorial Library). In English musical history, along with folk song, one inevitably finds historical research into traditional English dance. Butterworth was no slouch, as a famous piece of film from 1912 illustrates. His orchestral works are extraordinarily pleasant to hear, typifying the pastoral English tradition carrying its torch blazing bold against the surge of modern, atonal music that other countries, particularly Austria, were producing. Both styles of music appeared for good reasons (imagine the turmoil in creative arts as the twentieth century matured!) but it will always be the English music that features more on the playlists of popular classical radio stations, particularly Butterworth’s “The Banks of Green Willow”. 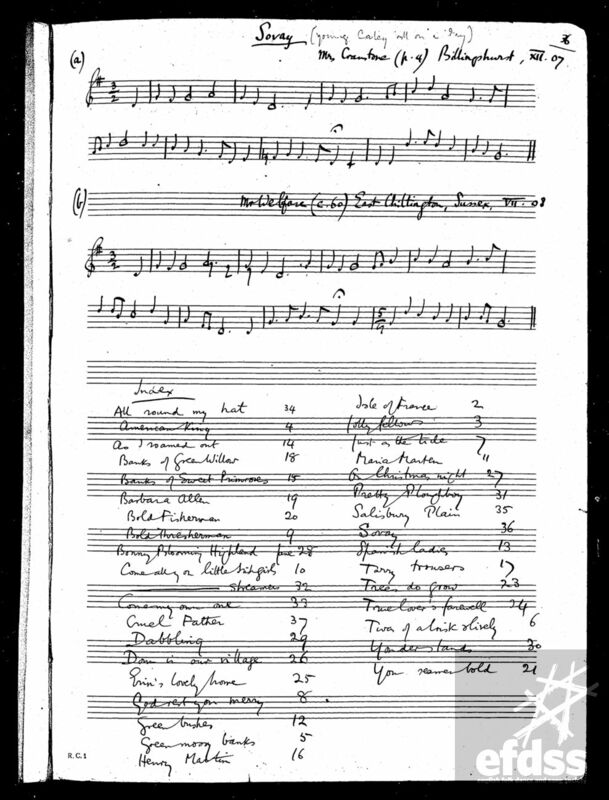 Other popular pieces include his English Idylls and the song-cycle to A. E. Housman’s poetry, “A Shropshire Lad”, from which the composer himself created an orchestral fantasy. “One of my most grateful memories of George is connected with my London Symphony, indeed I owe its whole idea to him. I remember very well how the idea originated. He had been sitting with us one evening talking, smoking, and playing (I like to think that it was one of those rare occasions when we persuaded him to play us his beautiful little pianoforte piece, ‘Firle Beacon’), and at the end of the evening, just as he was getting up to go, he said, in his characteristically abrupt way, ‘You know, you ought to write a symphony.’ From that moment the idea of a symphony — a thing which I had always declared I would never attempt — dominated my mind. I showed the sketches to George, bit by bit as they were finished, and it was then that I realized that he possessed, in common with very few composers, a wonderful power of criticism of other men’s work and insight into their ideas and motives. I can never feel too grateful to him for all he did for me over this work and his help did not stop short at criticism”. Could we play this piece today on the historic Erard piano at Firle Place, which we know to have been made several years before “Firle Beacon” was composed? At the moment, it appears not. For, unlike the celebrated library of music still safely on the publishers’ shelves, “Firle Beacon” has never been seen or heard since the composer played it. Why might this be? It seems true that Butterworth was a perfectionist. He destroyed many of his manuscripts before he went to the Battle of the Somme, wishing to avoid the possibility of unrevised, imperfect music being discovered in case he did not return from war. A sniper’s bullet fulfilled this nightmare. Butterworth posthumously received the Military Cross. Is this why the manuscript of “Firle Beacon” is lost? Or, could it be that, in his time walking on the South Downs, the young Butterworth might have brought his music to the great house at the heart of Firle, to let it be heard in the fine acoustic of the Great Hall? And, as a gift to his hosts, could he have left the manuscript there? Today, is it possible that this lost work by a revered son of English music may be discovered between two long-neglected books on a library shelf, or safely stored flat amid the pages of a leather-bound volume?